A leg curl machine is a machine designed for performing leg curl exercises. Enjoy quick, efficient, and comfortable leg workouts with the Body-Solid Cam Series Leg Extension and Curl Machine (GCEC340). 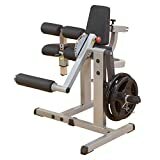 Ideal for home or commercial use, this leg workout machine lets you perform the two most important leg exercises from one comfortable sitting position. 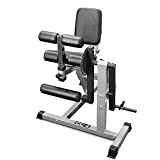 This machine features an easy-to-use, versatile design with an adjustable lifting arm that can quickly be repositioned for exercising both the hamstrings and quads. The fully adjustable 7-gauge steel cam easily accommodates users of any sizes, while thick DuraFirm padding ensures you stay comfortable while you work out. When assembled, the Body-Solid Cam Series Leg Extension and Curl Machine measures 49 by 42 by 37 inches (L x W x H) and weighs 97 pounds. It is backed by the Body-Solid Lifetime In-Home Warranty and Full Commercial Warranty. HEAVY-DUTY- Constructed of 2 in. X 2 in. solid Steel and designed with high-density, dual layered Vinyl padding to withstand intense stress. Strong enough to support up to 200 lbs. of weight plates. VERSATILE- Steel peg on the side of the frame comes out to adjust the bar in front or behind the weight peg. This feature is what allows the user to change the machine to perform leg extensions or leg curls. ADDITIONAL- Can be used with either Standard or Olympic Sized weight plates. 3-year frame, 2-year padding, 1-year hardware. The Valor Fitness CC-4 Adjustable Leg Curl Machine allows the user to perform two key leg exercises, leg extensions and leg curls, while staying seated in the same location. Featuring an easy to use Sun Dial adjuster to allow the user to increase the range of motion. The back seat rest can be adjusted forward/backward depending on the height of the user. Once in place, the adjustable thigh support keeps your legs in place while performing leg curl exercises, ensuring that the hamstrings exert maximum performance. While loading weight onto the plate pegs, either 1 in. Standard Plates or 2 in. Olympic Plates (with adapter installed) can be used with the Maximum Weight Load being 200 lbs. ✅CONVENIENT: The Soozier Adjustable Leg Curl Machine is a stand alone unit that allows you to do both leg curls and leg extensions without ever having to get up and change your seating position. ✅ADJUSTABLE: An adjustable backrest and thigh support offers you a custom fit that holds your body in place while working out. ✅SPACE SAVING: This compact unit has a footprint of just 52" x 38" with a 37" maximum height to help save space in your household. Stop wasting time and money traveling to that expensive gym you joined. Soozier's adjustable leg curl machine offers everything you need to tone and strengthen all of your leg muscles right in the comfort of your home. 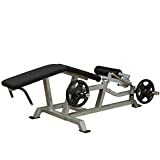 It's a stand-alone unit that allows you to do both leg curls and leg extensions without ever having to get up and change your seating position. This machine even includes a sun dial adjuster that allows you to vary the range of motions to better suit your body type. An adjustable backrest and thigh support offers you a custom fit that holds your body in place while working out. The padded seat and padded back provides you with a comfortable experience when training for extended periods of time. Even if you don't have a lot of room, this compact unit has a footprint of just 52" x 38" with a 37" maximum height to help save space in your household. 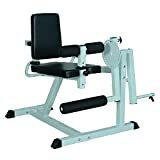 The Body-Solid ProClubLine Leverage Leg Curl Machine (LVLC) is designed to give you focused and intense leg workouts with comfort and safety specifically in mind. The uniquely designed V-bench offers total hamstring isolation while helping reduce back stress and unwanted knee forces. 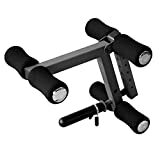 A direct link movement arm design and sealed bearing pivot points deliver smooth and continuous range of motion as you lift for an uninterrupted workout. 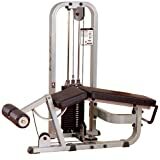 Made with a 2- by 3-inch 11-gauge high-tensile strength steel mainframe and double-stitched upholstery, this calf workout machine is durably constructed to stand up to rigorous use in gyms and clubs. It features side handles for stability and control while you workout, with fully adjustable foot rollers to fit users of all sizes. Weight plate holders are built into the machine for easy storage (plates sold separately). 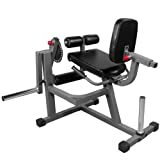 When assembled, the Body-Solid ProClubLine Leverage Leg Curl Machine measures 74 by 46 by 26 inches (L x W x H) and weighs145 pounds. It is backed by the Body-Solid Lifetime In-Home Warranty and Full Commercial Warranty. Pro Club Leg Curl Machine. This Leg Curl Machine sets the standard for workout comfort and convenience. There is not just ample strength, but highly regarded performance. And not just a comfortable workout, but one that can only be described as remarkably smooth. Compelling proof that a high quality, proven design never goes out of style. Uniquely engineered center drive cam distributes weight evenly to eliminate lateral torque. Biomechanically accurate pivot point ensures ergonomically correct body positioning for natural and complete Hamstring and Leg Biceps development. Elliptical cam keeps arc of movement smooth and provides variable resistance through full range of motion. Pop pin adjustable foot pads assure proper alignment. Finally, a form fitting machine that is big on strength, style and performance.